This easy chili cheese dip has just 3 ingredients and is done in under 20 minutes. It’s the perfect cheesy appetizer for game day or any party! 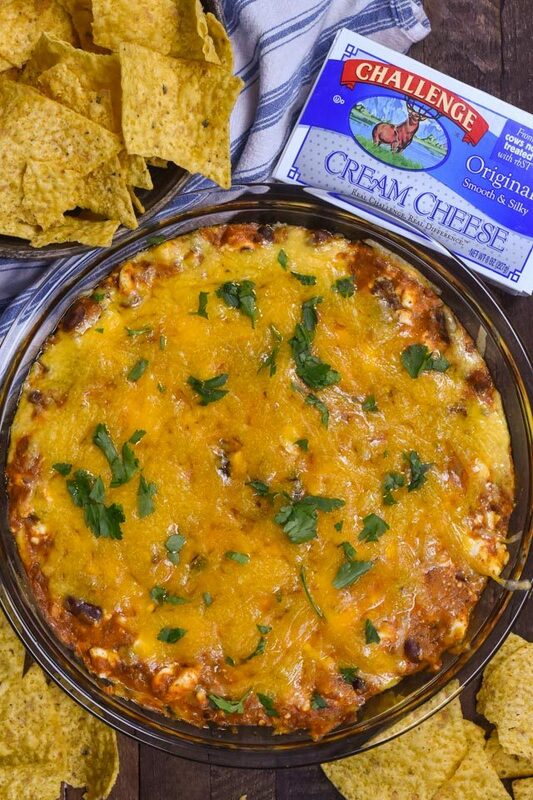 Challenge Dairy sponsored this post and their cream cheese is the perfect addition to this hot cheesy dip! This easy chili cheese dip is comfort food at it’s finest: a hot layer of chili and cream cheese mixed with cheddar cheese. It’s such a delicious way to eat your weight in tortilla chips. It has just three ingredients and is so sinfully good! There is one time of year I love making these sorts of gooey dip recipes: during football playoffs. January is a month where every weekend is dedicated to football as my husband hangs on to another season, dreading its end. The month is usually full of playoff watch parties, culminating in the biggest one of all for the big game in February. If you’ve read this blog for awhile, you’ll know my husband doesn’t eat much of what I make. He can give a hard pass to cookies or bread, cakes and even pie, but he can never say no to chili. When I first met Mel, we’d always have cans of chili in the cabinet. Chili was his go-to dinner if I didn’t feel like cooking or if he was home alone. So when I told him I was making this easy chili cheese dip, he started drooling immediately. It turns out that chili cheese dip isn’t just a good appetizer, it’s a fantastic dinner too. He inhaled this dip while watching the playoff games last weekend! My version of Chili Cheese Dip has just three ingredients: cream cheese, chili, and cheddar. There’s nothing fake in this appetizer, just delicious gooey chili flavor! 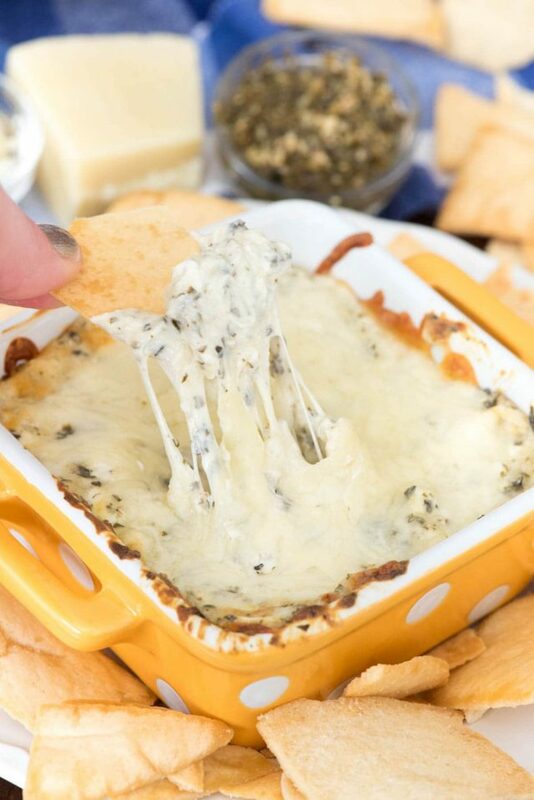 When I was thinking about what to make for my newest game day appetizer, I knew I wanted to do a hot and cheesy dip. I’ve made pizza dip before, as well as a cheesy pesto dip, and both were hits. Chili dip was my next great idea. Since there are only three ingredients in this recipe, you want to be sure to use the best ones you can find. I used Challenge Cream Cheese because it’s my favorite! It’s made the right way; the old fashioned way from the freshest milk and cream that comes from happy cows at family-owned dairies. There are no hormones, additives, or fillers and it’s a cooperative of California family-owned dairies, formed nearly 100 years ago. If you’ve read my blog long enough you’ll know that Challenge is a company that’s near and dear my heart. It’s the ONLY butter my parents will buy, so I grew up eating it. Same goes for their cream cheese! In addition to the cream cheese, I also use real cheddar cheese (not the fake stuff!) because I love the flavor of cheddar cheese on chili. When it comes to chili, just be sure to get a brand and flavor you like. It’s easy to make this dip vegetarian by using vegetarian chili, or use one with meat or beans as you wish. 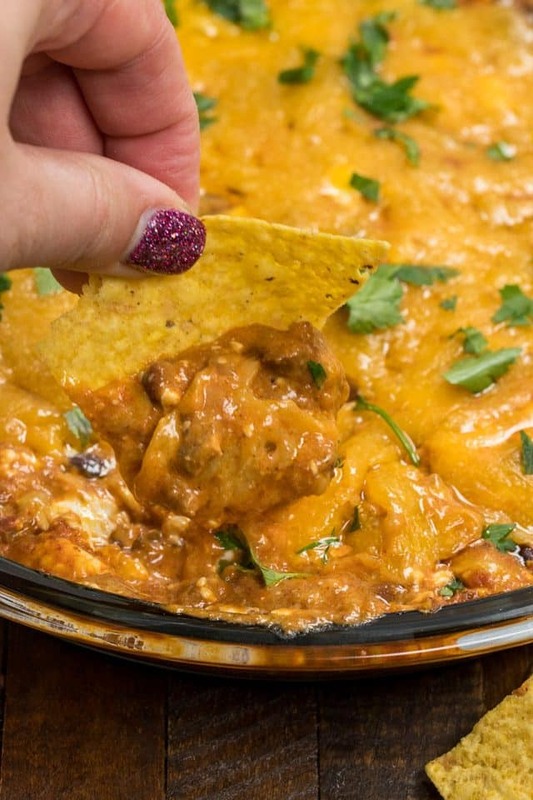 An easy chili cheese dip is the perfect game day appetizer. With just 3 ingredients it’s done in under 20 minutes and is fantastic with tortilla chips. Since the recipe uses cheddar cheese, be sure to bake it right before serving. Use your favorite chili brand and flavor. Want it spicy? Drizzle it with hot sauce after baking! Peanut Butter Football Dip also uses Challenge cream cheese. 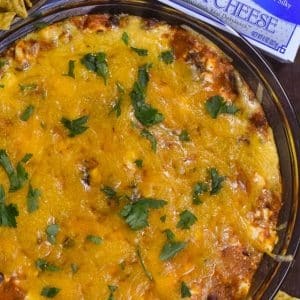 7 Layer Pizza Dip is also a hot cheesy dip! 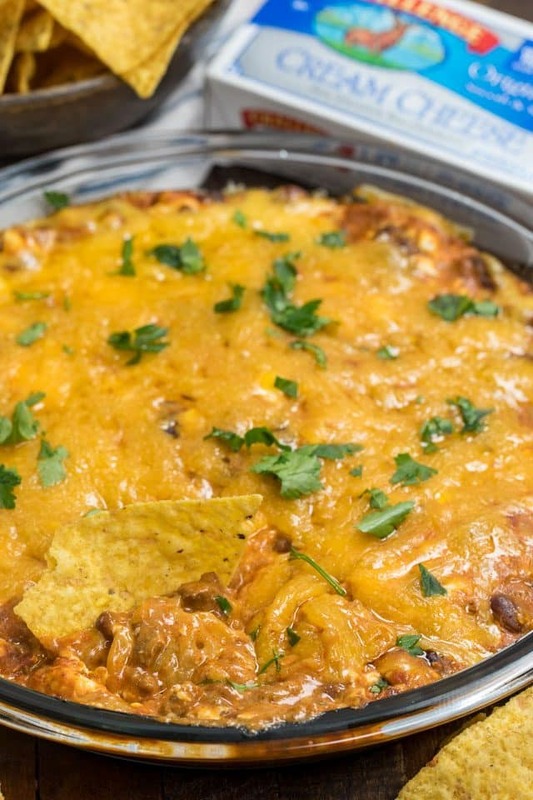 Chili Cheese Dip with 3 ingredients is perfect served hot with tortilla chips! Stir together cream cheese and chili until combined (mixture will be chunky). Stir in 1 cup shredded cheddar cheese. Spread mixture in the bottom of a 9-inch pie plate or similarly sized pan. Sprinkle with remaining shredded cheese. Bake until hot and cheese is melted, 10-15 minutes. Serve with tortilla chips. For a spicier dish, drizzle dip with hot sauce (to taste) after baking. Cheesy Pesto Dip is another fantastic appetizer. 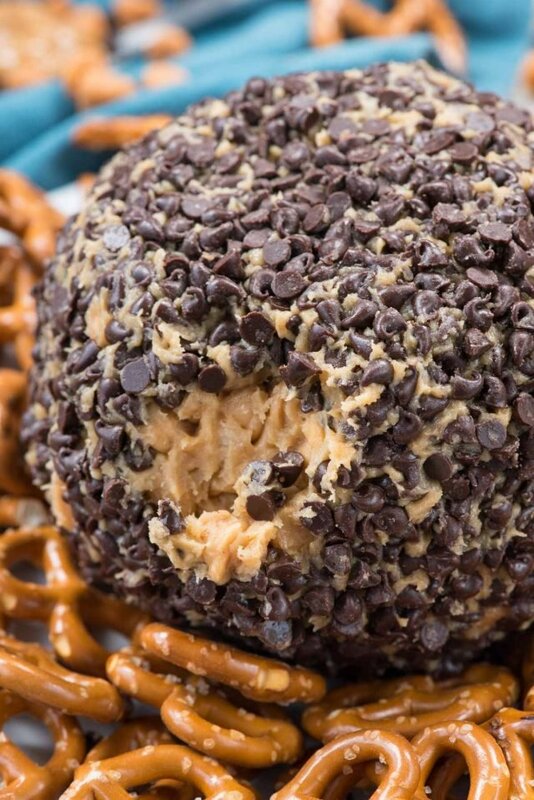 Make a sweet appetizer with my Peanut Butter Cheese Ball! Oh my gosh, wow! I could go for this right now!